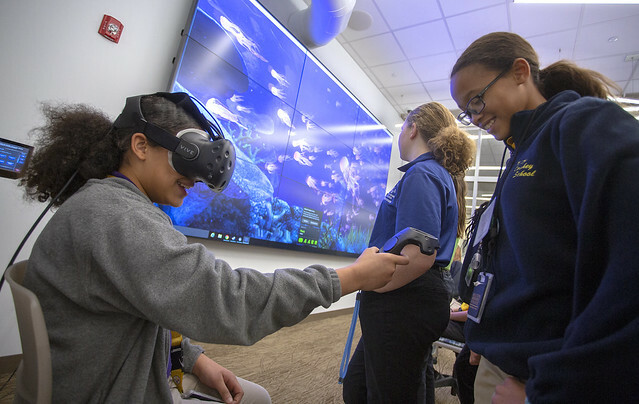 Deajanee Lee makes her way through a virtual undersea world during the STEM Goes Red event. Precious Garley always thought that CPR looked hard, until she had a chance to try it for herself. The eighth grader was one of two dozen middle school girls from the Milton Hershey School who spent the day at Penn State Health Milton S. Hershey Medical Center for the first regional STEM Goes Red event on Nov. 13. The interactive event was designed to encourage young women to improve heart and brain health by considering careers in science, technology, engineering and math. The Milton S. Hershey Medical Center hosted STEM Goes Red with the American Heart Association and Centric Bank. Ashley Parsons, executive director of the American Heart Association’s Capital Region, said the event was an effort to achieve equal representation for women in the STEM fields. Students talked with female executives, medical center faculty and researchers from Hershey Medical Center and Centric Bank in a speed networking session to discuss possible careers and the pathways to get there. Dr. Samantha Jacques, director of clinical engineering with Penn State Health, focused on careers in biomedical engineering. 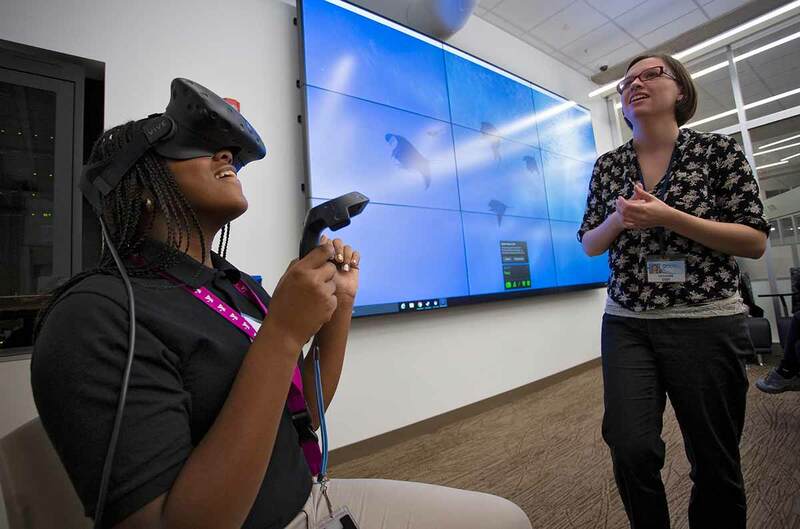 The girls experienced virtual reality, 3D design and printing in Penn State College of Medicine’s Technology Innovation Sandbox and tried their hand at video production in the One-Button Studio. They also had a competition to see who could successfully do cardiopulmonary resuscitation. Karen McDermott, director of social events for the American Heart Association’s Capital Region, told the girls they can be part of saving lives without having a medical degree. “Probably many of the jobs you will have don’t even exist yet because technology is advancing so quickly,” she said. Melissa Irvin, seventh-grade science teacher at Milton Hershey School, said she and five other science teachers chose girls who had an interest in STEM careers for the event. “They really valued the time the professionals took to talk with them, and they loved the simulation labs,” she said. Jenna Doersom said she was excited about the opportunity to come because she loves science.